I spotted this recipe in the June 2014 issue of Olive and was immediately intrigued. I LOVE earl grey tea so right away I thought it sounded delicious. Earl Grey tea has that calming bergamot flavor that I just adore. The cake is beautifully light and airy. 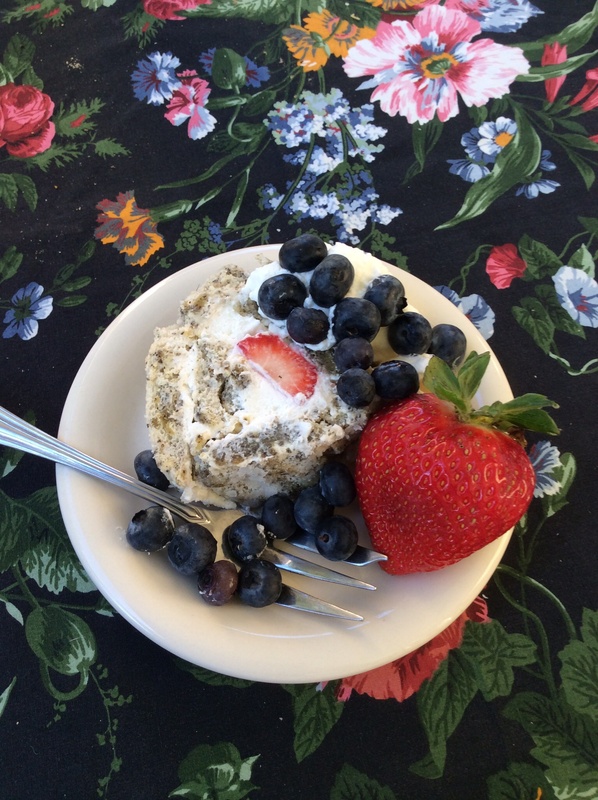 Paired with beautiful sweet strawberries and fresh whipped cream? Winner. Since this month’s “What’sBaking” theme is ‘seasonal fruit’ it fit in perfectly. This does take some time to prepare as the cake has to cool before it’s rolled, but the actual mixing, baking etc.. is generally pretty simple. Allow enough time to cool, roll then chill. Pre-heat oven to 350. Line a 9×13 baking sheet with parchment paper and set it aside. Place 1 tbsp of tea into lemon juice and heat slowly until brewing. Do not allow it to boil. Allow a few minutes to brew, stirring occasionally. Strain lemon juice through a sieve pressing the tea leaves to extract all of the moisture. Discard strained tea leaves. Crush the remaining dry loose tea with a mortar and pestle or give it a whiz in a small food processor. In a large bowl beat the egg yolks with 25g of the sugar until pale and frothy. Then add the flour, oil, dry loose tea, tea infused lemon juice and orange extract. Mix to evenly combine. With clean beaters in a large bowl bat the egg whites to soft peaks. Add the remainder of the sugar and beat until thick and glossy. Gently fold the whites into the yolk mixture, 1/3 at a time, until any streaks disappear. Spread into the prepared baking sheet, smooth with a spatula, and bake for 13 minutes until slightly browned. Lay a large sheet of parchment on the work surface. Flip the cake onto it (I found using a fish spatula to help the cake and parchment separate was helpful in a few spots. Lay another sheet of parchment out, liberally dust it with sugar and flip the cake onto it. Leave it to cool on a baking rack. When cooled make the filling (using the Filling Ingredients above). Beat the cream, lemon juice and sugar together until very thick. Using a soft spatula spread a thin layer of the whipped cream onto the cake. At one end line up the strawberries curved side down so the cake will roll up around them. 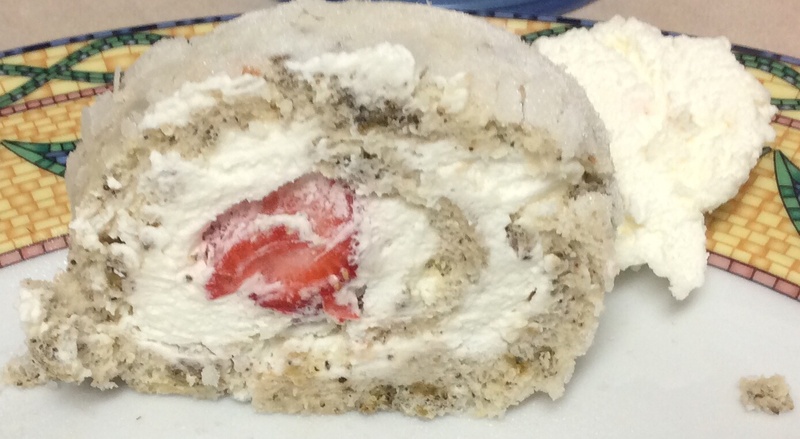 Carefully roll the edge of the cake over the strawberries, then continue to roll until all rolled up. Put one sheet of parchment around, make sure it’s rolled tight, and put in the refrigerator for at least an hour to set. When ready to serve, unroll parchment and gently slice down straight through the cake. Serve with additional whipped cream, berries etc.. While in London last month we had dinner one night at Nando’s which is a chicken restaurant with locations all over the UK (and world?) but there’s only one or 2 in th US. It’s a South African PERi-PERi chicken restaurant and it was delicious. I had a wrap with chicken and ordered a side of avocado and grilled halloumi with it. I love that they had that cheese-you never see it on menus here. When I returned home I wanted to make a similar sandwich as the sauce was so delicious! I found that my Fairway Market sold the sauces-yay! Check your market-they may sell it. If not the closest that I would use is Franks Wing Sauce with a touch of sour cream mixed in. The avocado is so nice and creamy and soothing, offsetting the spice of the sauce, the grilled cheese gives just a touch of crunch and tangy goodness. This is not a tremendous over-stufffed wrap, it’s very simple with very easy ingredients which compliment each other wonderfully. Slice the chicken breast in half horizontally to make two pieces of similar thickness. season with salt and pepper. Grill-either outside or with a grill pan, panini press etc.. then chop into small pieces. Drizzle with a little of the Nando’s sauce, stir and set aside, covered, to keep warm. While the chicken is cooking slice the cheese into 1/4 inch strips and place in a non-stick pan over medium heat. Watch it carefully. It will heat and begin to darken. when it reaches a nice brown, flip it over to cook the other side. Remove and set on a board. Cut into long strips. Slice the avocado into thin strips. 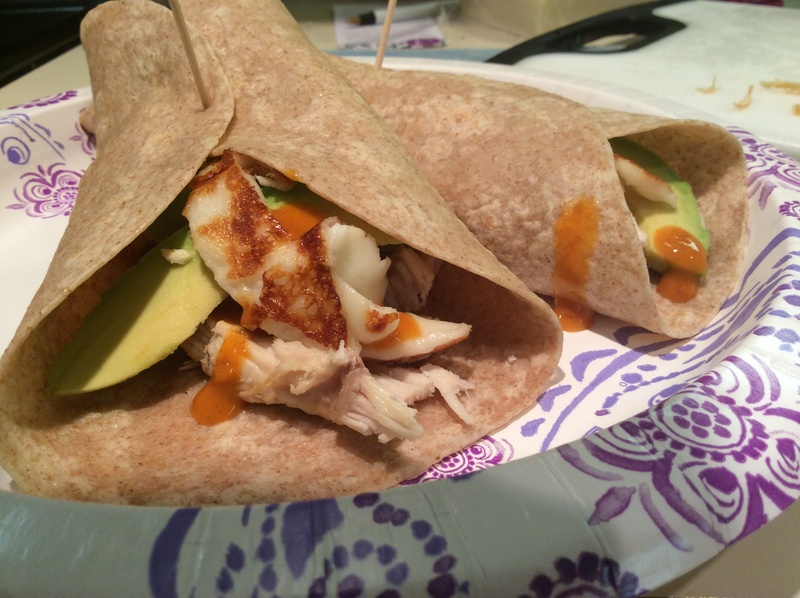 Warm the wraps in the microwave for 10-15 seconds. Starting with the cheese spoon half of the cheese down the center of each wrap, followed by half of the chicken, followed by a drizzle (or river-it’s up to you) of the sauce finishing with the avocado. If you’ve never had halloumi cheese-it’s a tangy, salty cheese that can be heated but won’t melt-it jut gets a little crispy. I’ve also seen it sold as ‘grilling cheese’.